This tarping machine was custom built by Hanson Industries and only has approx. 1,050 hours of use. It is 12’ x 34’ and will handle a 42’ wide tarp. 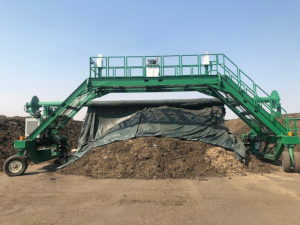 Can be used for covering compost or many other materials as well. It is ran for about 1 hour per day and can be demonstrated. © 2000-2019 Unlimited Resources Corporation. All Rights Reserved.